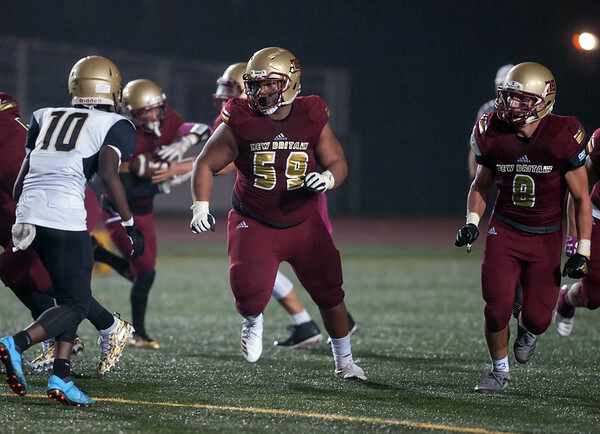 NEW BRITAIN - Somewhere along the way, the New Britain football team heard Raquan Tompkins say East Hartford had the best offensive line in the state. The Hurricanes took that personally and let the Hornets know. Shawn Robinson ran for 271 yards and three touchdowns, while Tahje Yopp ran for 183 yards and four scores of his own as No. 16 New Britain routed No. 13 East Hartford 63-26 at Veterans Stadium Friday night to remain in the Class LL playoff race. The Hurricanes (7-1) began the game in the eighth spot, the Hornets (6-2) were No. 9. Overall, the Hurricanes (7-1) ran for 468 yards — 274 of which came in the first half — and eight touchdowns. Tarik Hetmyer scored a 7-yard run to close out the scoring in the fourth quarter. Both Robinson and Yopp hit the century mark and crossed the goal line twice before the first half even ended. Robinson had 152 yards and touchdown runs of 38 and 5 yards. The latter of which came with just 38 seconds left in the second quarter. Yopp, meanwhile, had 102 yards on just eight carries with scores from 11 and 12 yards out in the first 12 minutes. The quarterback also connected with Hetmyer on a 50-yard touchdown on the third play of the game following a timeout, letting East Hartford know what kind of night it was going to be 1 minute and 29 seconds in. As the two teams jogged off the field at halftime, New Britain led 35-20. But the end of the third quarter it put up 21 more points on the scoreboard and led 56-20. But the Hornets did make it a competitive, at least for a little while. Tompkins ran for two touchdowns in the second quarter, his 50-yard run cutting the Hurricanes’ lead to 28-20 with 7:33 before halftime. Tompkins finished the game with 177 rushing yards and three touchdowns on 13 carries. His 59-yard run in the fourth quarter came in garbage time with the game well out of hand. The signal caller also completed 9-of-25 passes for 131 yards and threw two interceptions. Both picks led to New Britain touchdowns. Dashawn Clark’s interception in the first quarter led to Yopp’s 12-yard run and defensive lineman Jason Shumpert’s takeaway in the fourth led to Hetmyer’s second touchdown. The Hornets ended the first half with 231 total yards and had just 90 from the third quarter on. As always, New Britain will now have 24 hours to enjoy the win. Then it’s time to get ready to face Enfield (2-5) next Friday night at home. Rushing—New Britain: Shawn Robinson 27-271-3TD, Tahje Yopp 15-183-4TD, Chris Maldonado 2-15, Tarik Hetmyer 3-7-TD, Johnny Valez 1-(-14). East Hartford: Tompkins 13-177-3TD, David Ortiz 5-15, Quinton Haughton 1-2, Troy Baxter 1-(-2). Passing—New Britain: Yopp 1-4-50-TD. East Hartford: Tompkins 9-25-131-2INT. Receiving—New Britain: Hetmyer 1-50-TD. East Hartford: Jaquan Allen 6-55, Haughton 3-44, Jayden Gardener 2-32. Posted in New Britain Herald, New Britain on Friday, 2 November 2018 23:12. Updated: Saturday, 3 November 2018 00:34.